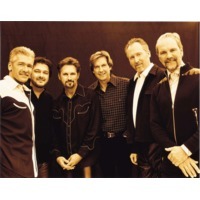 Diamond Rio is an American Country music/Christian music band formed in 1984 in Nashville, Tennessee. Since its foundation, the group has comprised the same six members: Gene Johnson (mandolin, guitar, fiddle, tenor vocals), Jimmy Olander (lead guitar, Dobro, Danelectro, banjo), Brian Prout (drums), Marty Roe (lead vocals), Dan Truman (keyboards, organ, synthesizer), and Dana Williams (bass guitar, baritone vocals). Diamond Rio was signed to Arista Records in 1988. Due to a series of health issues affecting three of its members, however, the band did not make its debut until 1991, with the release of the single "Meet in the Middle". It reached Number One on the Billboard Hot Country Singles & Tracks (now Hot Country Songs) charts, making Diamond Rio the first country music group in history to reach Number One with a debut single. "Meet in the Middle" was followed by thirty-two more chart singles throughout the band's career, including four more Number Ones: "How Your Love Makes Me Feel" (1997), "One More Day" (2001), "Beautiful Mess" (2002), and "I Believe" (2003). Diamond Rio has recorded seven studio albums, two Greatest Hits compilations, and an album of Christmas music. Three of the band's albums have achieved RIAA platinum certification in the United States. In addition, Diamond Rio has received four Group of the Year awards from the Country Music Association, two Top Vocal Group awards from the Academy of Country Music, and thirteen Grammy Award nominations.